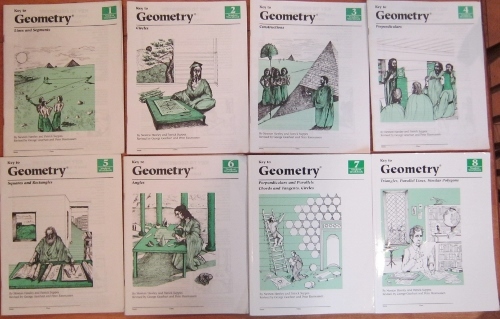 Presented in eight booklets (the first six just over 50 pages each and the last two around 150 pages each), Key to Geometry is a discovery-based approach to the topic. This is a hands-on course and on every page the student works with a pencil, compass, and straightedge to construct figures and to discover their properties. The student learns about lines, segments, circles, perpendiculars, squares, rectangles, angles, parallels, chords and tangents, triangles, and polygons. To read my complete review, visit The Curriculum Choice. This is my fourth time through the course, and I value it more each time. I enjoy how it makes my children tap into a different way of learning, how it reinforces the importance of careful and precise work, and how much of it can be done together on the couch. Key to Geometry is also a refreshing Charlotte Mason approach to mathematics. Lovely!